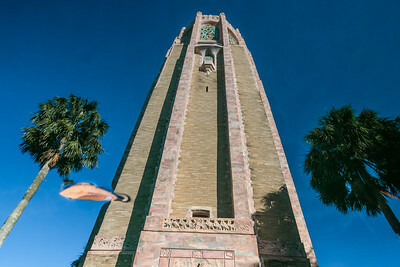 Bok Tower and gardens in Lake Wales, FL. One of the most underrated attractions in Florida. 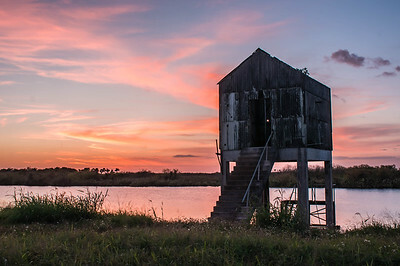 Most who have lived in Florida for years might ask twice about the location mentioned, and typically might say "I think I've heard of that"? 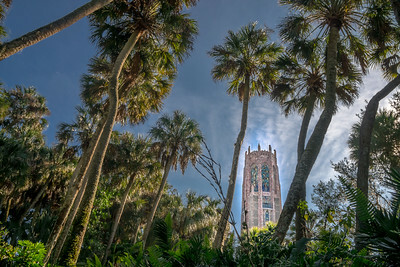 The tower and lush gardens designed by Olmsted Jr. are overshadowed by their close proximity to the highly marketed Orlando attractions. 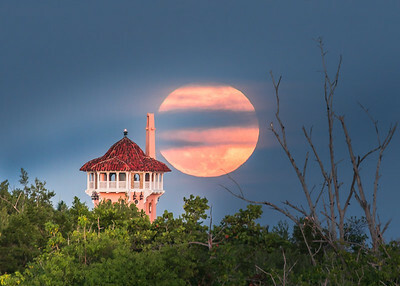 The pink marble clad "Singing Tower" is built atop an iron dome formation as can be seen in the red clay as one drives beyond the gates, through citrus groves to the gardens. The tower cannot be seen while progressing through the gardens, then- suddenly through the curtain of cabbage palms it reveals itself. Surrounding the base of the tower is a large grove of Live Oaks draped in blankets of moss. The underside of the oaks frame the grand vistas that can be seen from atop one of the highest natural points in Florida. 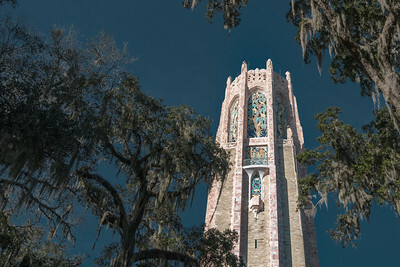 Then, as one looks to the tower, it is framed in the tops of the grand oaks. The pink marble contrast well in the tree canopies and clear late afternoon sky. Surrounding the base of the Bok tower are large reflection pools. On a calm day one need not look up, but instead look to the reflection pool. Here, a single Live Oak leaf drifts through the scene, touching the tower at it's base and interrupting tranquility in its own way. 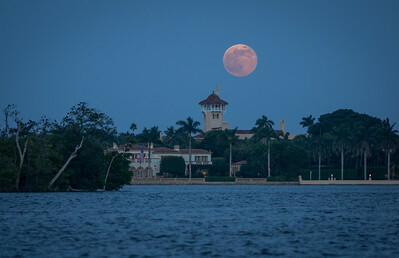 A beam of moonlight briefly illuminates the Maralago estate late in the evening. 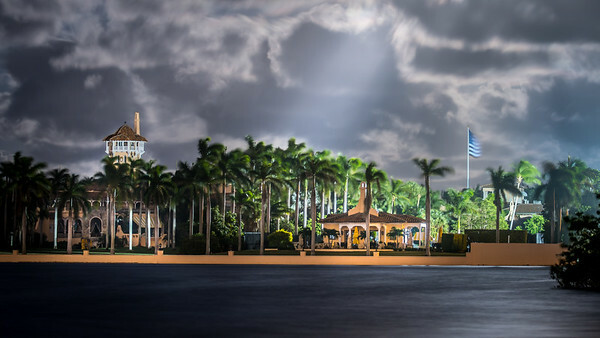 This long exposure image shows the breezy conditions in the many Royal Palms and American flag. Holding steady are the estate buildings and iconic tower rising above. 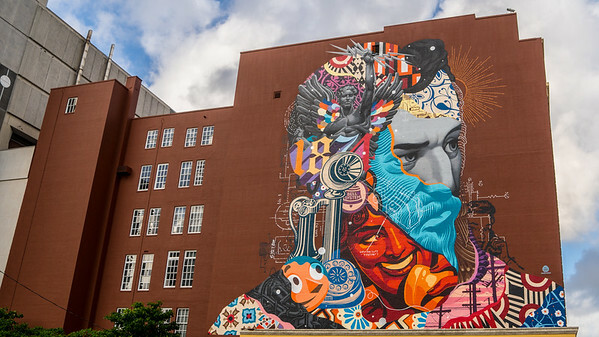 This mural amid the downtown buildings in the City of West Palm Beach, FL was painted by a very talented artist, Tristan Eaton. It adorns the first telephone Central Office in the city but was replaced by the industrial grey building that can be seen next door. 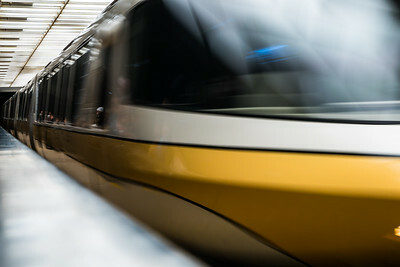 Disney gold monorail on approach to Epcot station. Faces of tired park goers can be seen in reflection as the monorail slows to allow boarding. 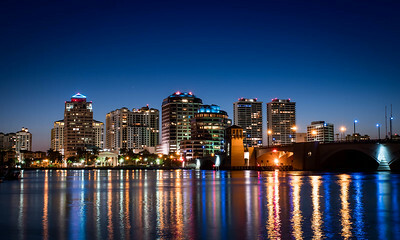 As close to London as one will get in Florida. 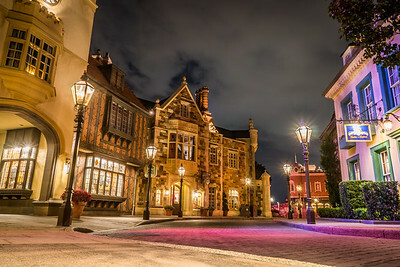 Quiet night just before park closing in England pavilion at Disney's Epcot, Orlando, Florida. 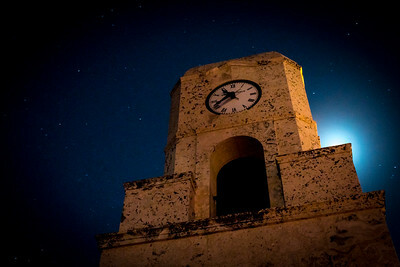 At the end of Worth Ave, Palm Beach, at the beach stands a grand clock tower. Photographed this night backlit by a full moon. 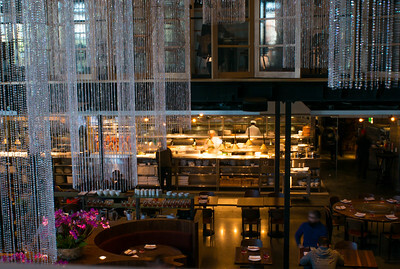 Notice the mystery man in the private upstairs area..Morimoto himself? One will never know. 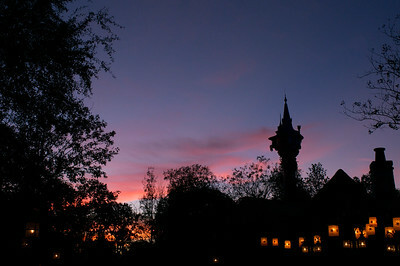 Silhouette of Rapunzel's Tower in the Magic Kingdom with sunset behind. 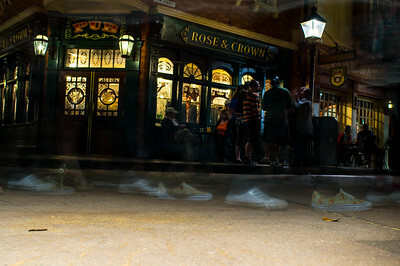 An evening at the Rose and Crown pub in Disney's Epcot. While those who have stopped to enjoy a "Pint" can clearly be seen, ghostly park goers quickly shuffle by in this three second exposure. 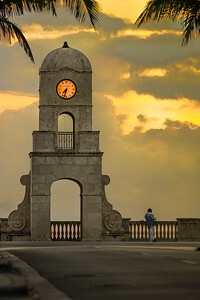 This clock tower stands at the beach end of the famous Worth Avenue in the Town of Palm Beach, Florida. Captured at Sunrise as a well dressed man checks his phone for the time? President Trump's Maralago Club, Palm Beach, FL. 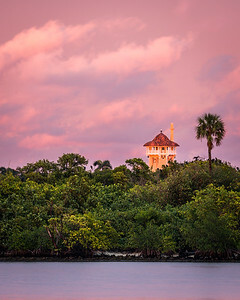 The Maralago Club tower rises above the tree line of Audubon's Bingham Islands in this sunset view looking toward Palm Beach. 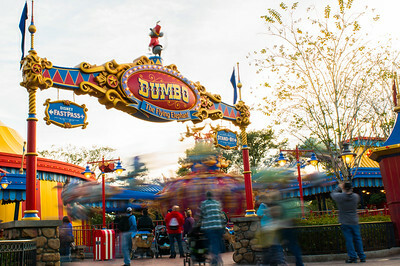 Come ride the famous Dumbo, the flying elephant! This iconic Disney park ride still thrills young and old. 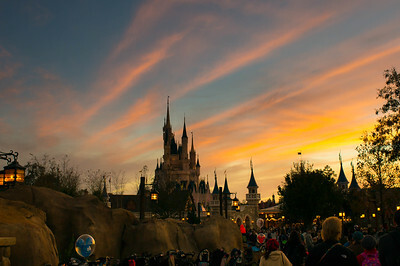 Sunset magic in the Magic Kingdom near Orlando, Florida. 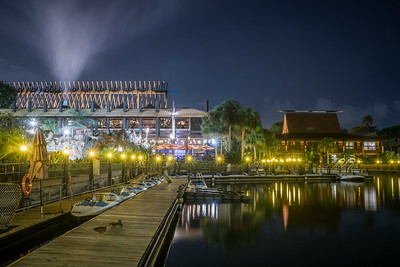 While the outside of this popular Disney resort is seemingly quiet, inside people gather at the O'hana restaurant at the end of a day. The essence of oak and hickory grilled meats filled the air as this image was captured.